As music software has made become increasingly more affordable and user friendly over the years, so there have been many more people turning their creative abilities towards making music with it. If there is a downside to this then it is perhaps that there is a discernible rigidity to some of the tracks being produced solely within the confines of digital means. Some producers have been addressing this by dirtying up their tracks, applying extra noise and swing in their DAWs to try and replicate the authentic raw thrum of analogue gear, others by moving back towards a hardware-based studio. John Heckle, the Merseyside producer who secured his first release while still a schoolboy is of the latter camp. Though his first forays into production were via cracked software, he went from there to experimenting with drum machines during DJ sets and on to a hardware-based studio after being blown away by seeing Jamal Moss play live. Dedicating himself to the task of mastering his new set-up, his efforts were rewarded by having his first release as John Heckle on Moss’s Mathematics label. He has continued apace, issuing raw, machine driven techno for the likes of Tabernacle, Mathematics and Crème Organization, all the while honing an impressive live PA with a selection of his favored kit. In advance of his live PA in Fabric’s room one this Saturday, Little White Earbuds got in touch with the young producer to talk inspiration, synth-love, and to find out why no-one has remixed any of his tracks. He also treated us to a special live set of his own productions, including some exclusive and unreleased cuts that form our 153rd exclusive LWE podcast. I understand you started out very young, going to events as a young teenager and having your first record out at the age of 16. When did you start buying records and DJing? 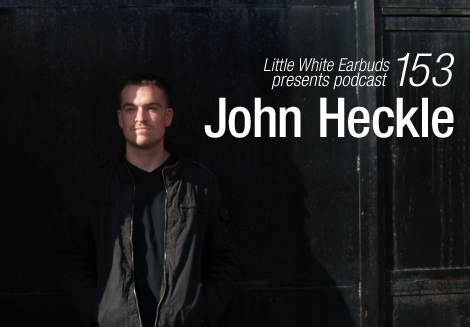 John Heckle: I was about 14 when I started getting my own records. For a year or so before that I had been borrowing my brother’s, which we used to play on a set of horrible belt-driven turntables at home. There was a shop in Liverpool called X-Fade, and I’d listen to all the British Murder Boys, Jeff Mills, Dave Clarke et al. records there when they came out. I got all my first techno records from there, but the shop shut down a few years ago unfortunately. Your bio mentions that your first release came out thanks to Regis. How long had you been producing for at this time and how did the release come about? Did you send a demo to him? I used to make tracks for fun on the home computer and play them during warm up sets at my brother’s Alcatraz parties in Liverpool. Karl played the night a bunch of times, and he took a CD of mine to Harvey Lane’s RSB Records in Birmingham. The release came entirely out of the blue, a huge surprise and an honor. I was still a schoolboy, well out of my depth! What gear were you using for producing as Hek? Just a bunch of cracked software like Fruity Loops and Cubase. I didn’t even know my way around them properly, and I got frustrated after a while. Having that first release was lucky, so after a while I stopped trying to repeat it and left software alone. There were a couple of years in between your last Hek release and your re-emergence producing under your given name. What developments were you undertaking in this time in terms of your sound? Well I concentrated on college for a while. I carried on DJing, playing the occasional night outside of Liverpool and organizing my own small techno parties in the city, but I didn’t have a whole load of time to pick up production again. I was playing around with drum machines in DJ sets but that is as far as it went. I went with a friend to Antwerp in 2009 to watch Surgeon and Hieroglyphic Being live. Jamal played with a bunch of machines I didn’t recognize, and seeing it made me want to make music again. Me and my brother got hold of a keyboard, and it snowballed from there. You favor hardware over software. What’s in your studio at the moment? I still have the Juno-G workstation, a -106, a -6, a K4, a Blofeld, a few Alesis and Boss effects units, a 707, a 505, and most recently an Acidlab Miami and a xoxbox. Do you feel that spending time with fewer options (machines) makes you focus on mastering their functions more, rather than having a seemingly limitless array of plug-ins and presets to use with soft synths? Absolutely. After getting the Juno-G, I spent about 18 months getting completely to grips with it. It wasn’t until I had gotten more gigs that I got the 707, then the 106 and so forth. Everything has been acquired one at a time, so I have always had time to get used to a machine before getting something new (or old, as the case usually is). Are there any pieces of kit you want to get your hands on at the moment? When did you start integrating drum machines and synths into your DJ sets? I started using drum machines at small parties in Liverpool that I used to help organize. I was probably around 17, and I got a check through from my first Hek release — enough to buy a 505 and a Novation Drumstation. I’d use the 505 as a sequencer for the 909 sounds on the Drumstation and do my best Jeff Mills impression. And can you run us through what your live PA consists of? When I first began doing live sets, I would take the Juno-G, the -106, the 707, a couple of effects units, a sp404 sampler and a small Mackie mixer. I would either rely on friends helping me out carrying the stuff, or I would have a hard time dragging the whole lot onto public transport. I have scaled it down a little now. I only use the one keyboard and I have added a couple of rack synths. Listening to your productions there are very obvious Chicago and Detroit influences. Are there other influences for you either musical or not that inform your productions? I love the aesthetic of Bob Dylan’s early recordings. I know musically it is poles apart from what I can do (or ever dream of doing), but I like how rough and ready a lot of his stuff is. It’s not polished, the sound quality isn’t always great, it sounds like it was recorded in one or two takes and improvised. Basically, you can hear the heart and soul of his music. I saw a documentary about “Like a Rolling Stone” and how an amateur session-guitarist plays organ on the track. It ends up sounding a bit jarring and everybody but Dylan himself wants it turned down in the mix. Ultimately, it doesn’t sound perfect, but it gives the record a charm that 99% of records can’t claim to have. At a time now when everything is polished beyond recognition, I see this kind of aesthetic as an advantage rather than a flaw. Judging by your output you either make music quite quickly or you spend a lot of time in the studio. How long do you typically take to make a track? And what is the process like for you? Do you sequence things completely or do you jam and record on the fly too? I try not to spend too much time on making single tracks. For the most part I’ll record something before the day is up. If a track isn’t finished after a day, then I’ll rarely want to go back to it. Mostly they are just jams. I’ll have a small idea where I want a track to go when I hit record, but how it gets there is anyone’s guess — I’ll usually arrange it on the fly. There have only been a couple of occasions when I have needed to extensively sequence a track. Your recent mini album for Crème Organization seemed a bit more chilled out than your The Second Son album. Were you going in to the album specifically trying to make more melodic, “nicer” tracks or did that just happen coincidentally? That’s just the way it went; what with having a few different pieces of kit at the time, I had a few other directions I could go with new music. I’m really happy with the way it turned out. Can you tell us about your Merseyside supergroup, the Phantom Planet Outlaws and are we likely to see further releases from them? Most definitely. Just a few weekends ago I was with Mark Forshaw and Binny making some music and working on a new live performance. You have quite a few remixes to your name, however to date you haven’t let anyone touch any of your productions. What has been the reason for this and are you going to have anyone remix you in the future? It’s not that I haven’t let anyone; the opportunity hasn’t arisen properly until now. It’s actually quite difficult to try and get parts for people to remix after-the-fact, when the original recording is long-finished and the hardware has been tampered with. That said, there will hopefully be a remix project coming soon with Tabernacle. What can you tell us about the podcast that you’ve put together for us? It’s a bunch of stuff I don’t usually play in the live performances. Some B-sides, album tracks and unreleased stuff performed again and stuck together in an extended jam. And what can we expect from John Heckle in the next year? I’ll be keeping busy. If all goes to plan, a new album on Tabernacle will be the next big project. Then I want to work on some brand new stuff for Mathematics, as well as finishing off a few other projects. Lots to look forward to. great talent and a very nice guy! fck yeah! his fact mix has been on repeat in the last days and his releases are all killer. exited to hear this. HOW THE FRAZMONKEY DID I MISS THIS????? ?